BUFFALO BILL'S WILD WEST SHOW IN GLASGOW. 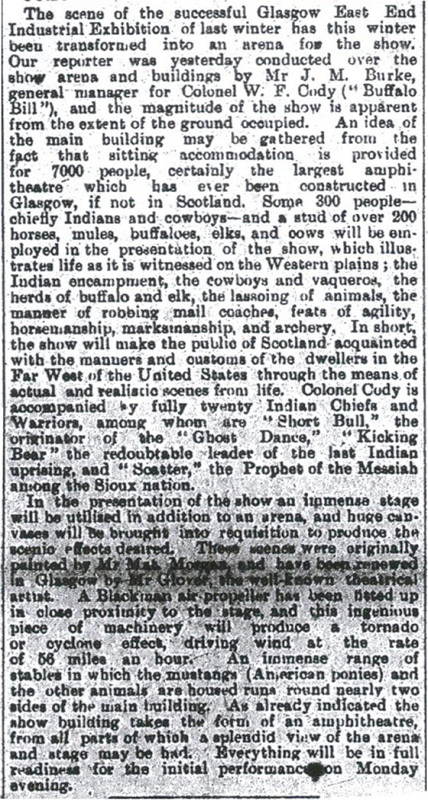 THE appearance of the "Wild West Show" in Glasgow at this time must be a source of great interest and entertainment to the inhabitants of the western metropolis; and it is a pity that the management has not seen its way to extend the visit to Edinburgh. Not a few people have, of course, seen this great show in London; but thousands have not, and about Christmas time it would have formed a welcome addition to the amusements of the metropolis. Cheap trains are, however, promised to Glasgow during the nine weeks the "Wild West" and the "Commercial West" are to be together, and no doubt many Edinburgh people will take the opportunity of running through to Glasgow to see this unique exhibition. 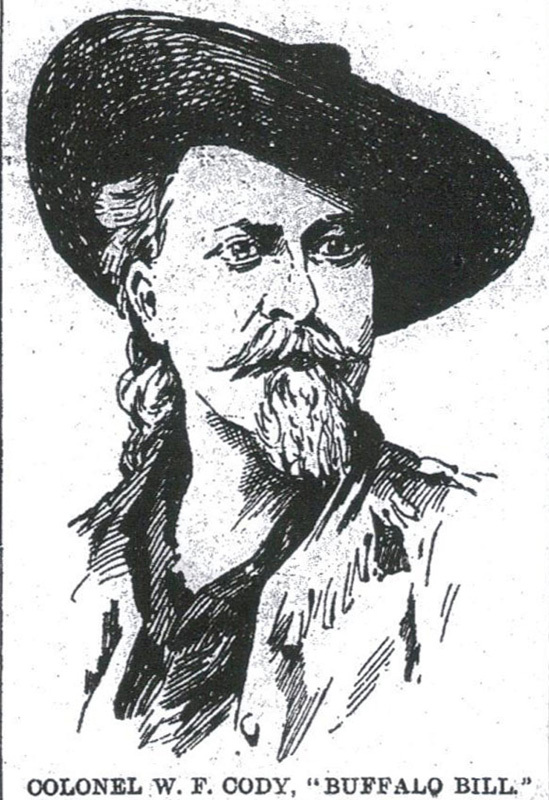 We give above a portrait of Colonel W. F. Cody, who is better known under his American sobriquet of Buffalo Bill. Brought up on the Indian frontier of Iowa, his early life was one full of adventure and excitement. He was born, one might say, with a rifle in his hand; his boyhood was passed on the prairies among buffaloes and Red Indians; and he became so familiar with the "great American desert," as the plains used to be described on early maps, that he became, while hardly out of his teens, one of the best scouts and guides for the United States Government expeditions which had so frequently to be undertaken against the turbulent Sioux and Pawnee tribes. He was also for a time a trooper and non-commissioned officer in the Kansas cavalry—a regiment which bore a large share in Border warfare. In 1872 he was elected a member of the Nebraska Legislature, and thus acquired the title of honourable. He gave up legislative pursuits, however, for more congenial occupation, and in 1876 he was in the Sioux war of that year, and distinguished himself in a hand to hand conflict with the Cheyenne chief Yellow Hand, whom he overthrew. In 1886 he was chief of the scouts under General Sherman in the Indian campaign of that year. In the great show, of which Colonel Cody is the head, an attempt is made to give an illustration of frontier life in the old days, and with his band of genuine Reskins, including some famous chiefs, a band of venerable cow-boys, who look after the rough cattle which have taken the place of the buffalo on the great pampas of America, and studs of wild horses, the representation aimed at becomes of a very realistic and exciting nature. COLONEL W. F. CODY, "BUFFALO BILL." The scene of the successful Glasgow East End Industrial Exhibition of last winter has this winter been transformed into an arena for the show. Our reporter was yesterday conducted over the show arena and buildings by Mr J. M. Burke, general manager for Colonel W. F. Cody ("Buffalo Bill"), and the magnitude of the show is apparent from the extent of the ground occupied, An idea of the main building may be gathered from the fact that sitting accommodation is provided for 7000 people, certainly the largest amphitheatre which has ever been constructed in Glasgow, if not in Scotland. Some 300 people—chiefly Indians and cowboys—and a stud of over 200 horses, mules, buffaloes, elks, and cows will be employed in the presentation of the show, which illustrates life as it is witnessed on the Western plains; the Indian encampment, the cowboys and vaqueros, the herds of buffalo and elk, the lassoing of animals, the manner of robbing mail coaches, feats of agility, horsemanship, marksmanship, and archery. In short, the show will make the public of Scotland acquainted with the manners and customs of the dwellers in the Far West of the United States through the means of actual and realistic scenes from life. Colonel Cody is accompanied by fully twenty Indian Chiefs and Warriors, among whom are "Short Bull," the originator of the "Ghost Dance," "Kicking Bear" the redoubtable leader of the last Indian uprising, and "Scatter,"  the Prophet of the Messiah among the Sioux nation. In the presentation of the show an immense stage will be utilised in addition to an arena, and huge canvases will be brought into requisition to produce the scenic effects desired. These scenes were originally painted by Mr. Mat Morgan, and have been renewed in Glasgow by Mr Glover,  the well-known theatrical artist. A Blackman air propeller has been fitted up in close proximity to the stage, and this ingenious piece of machinery will produce a tornado or cyclone effect, driving wind at the rate of 56 miles an hour. An immense range of stables in which the mustangs (American ponies) and the other animals are housed runs round nearly two sides of the main building. As already indicated the show building takes the form of an amphitheatre, from all parts of which a splendid view of the arena and stage may be had. Everything will be in full readiness for the initial performance on Monday evening.